AP US History: Secrets of the AP Exam Orwhat you need to know to get through the next 32 weeks and pass the exam. 2 AP US History: Secrets of the AP Exam Orwhat you need to know to get through the next 32 weeks and pass the exam. 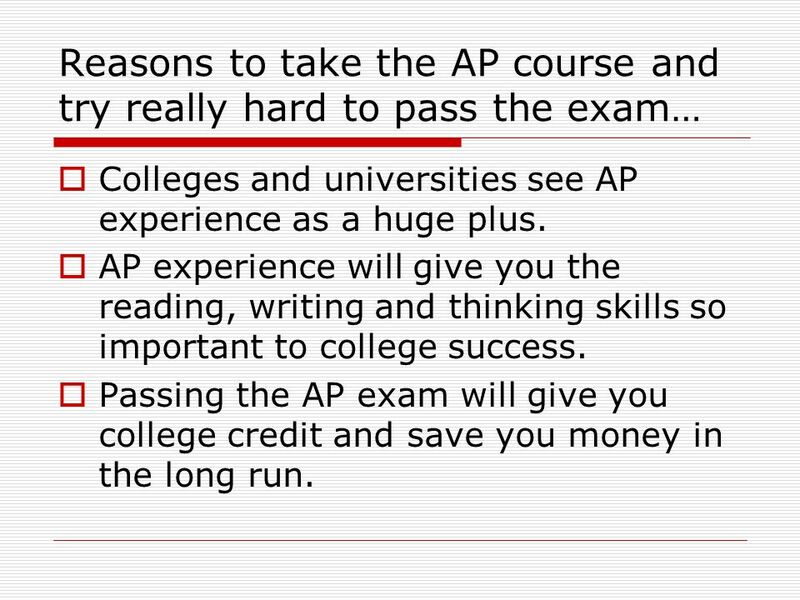 3 Reasons to take the AP course and try really hard to pass the exam… Colleges and universities see AP experience as a huge plus. AP experience will give you the reading, writing and thinking skills so important to college success. Passing the AP exam will give you college credit and save you money in the long run. 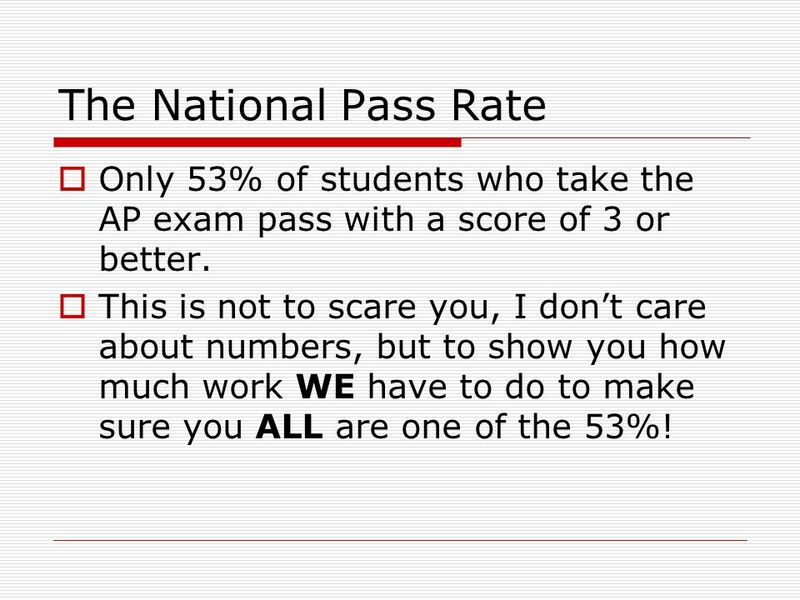 4 The National Pass Rate Only 53% of students who take the AP exam pass with a score of 3 or better. This is not to scare you, I dont care about numbers, but to show you how much work WE have to do to make sure you ALL are one of the 53%! 5 How is the Exam Structured? 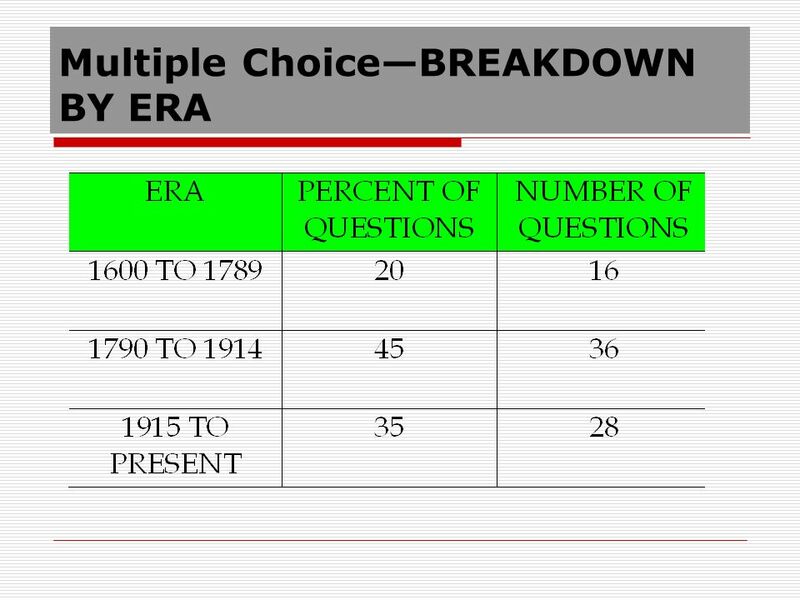 Part IMultiple Choice-80 Questions (55 minutes) 50% of the final score Part IIWriting Section – 1 DBQ & 2 Essays (130 minutes:60 & 70) 50% of the final score. Of that, the DBQ counts for 45%( 22.5% overall ) and the 2 essays combined for 55%( 27.5% overall ). 6 How well do I need to do on the multiple choice section? 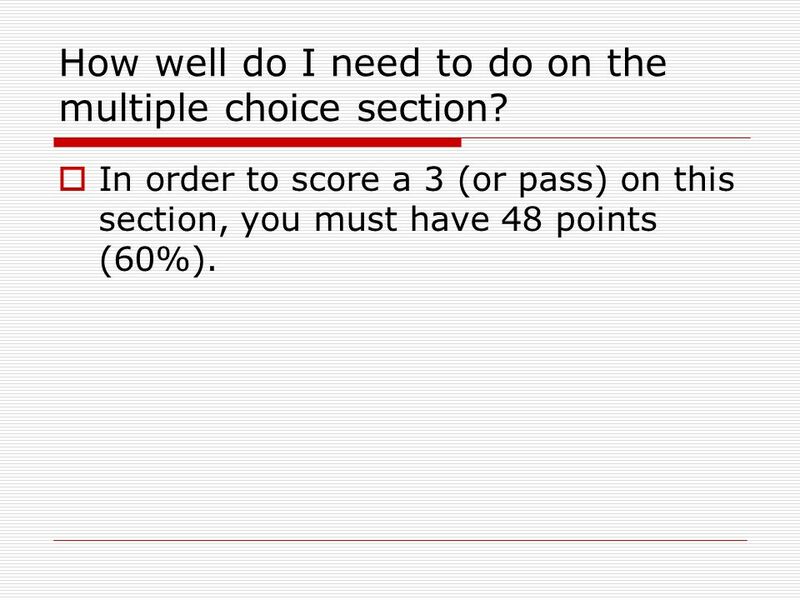 In order to score a 3 (or pass) on this section, you must have 48 points (60%). 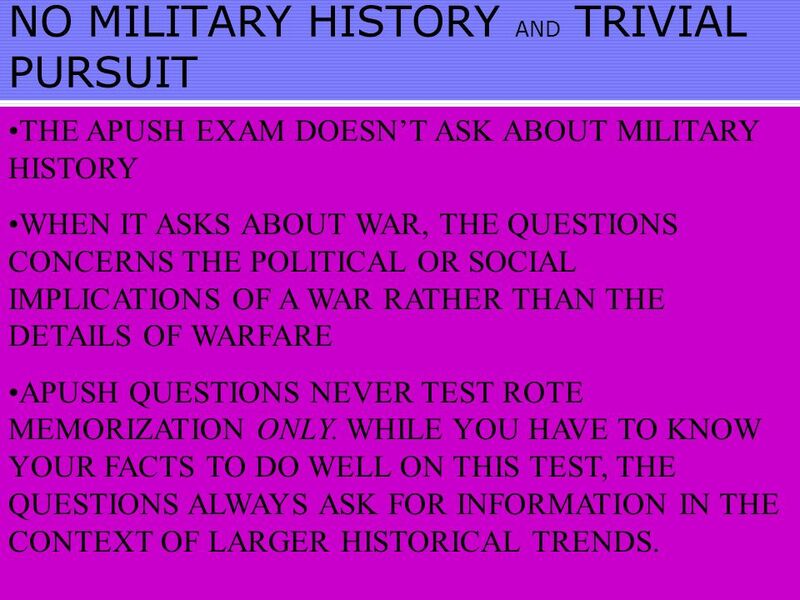 10 NO MILITARY HISTORY AND TRIVIAL PURSUIT THE APUSH EXAM DOESNT ASK ABOUT MILITARY HISTORY WHEN IT ASKS ABOUT WAR, THE QUESTIONS CONCERNS THE POLITICAL OR SOCIAL IMPLICATIONS OF A WAR RATHER THAN THE DETAILS OF WARFARE APUSH QUESTIONS NEVER TEST ROTE MEMORIZATION ONLY. 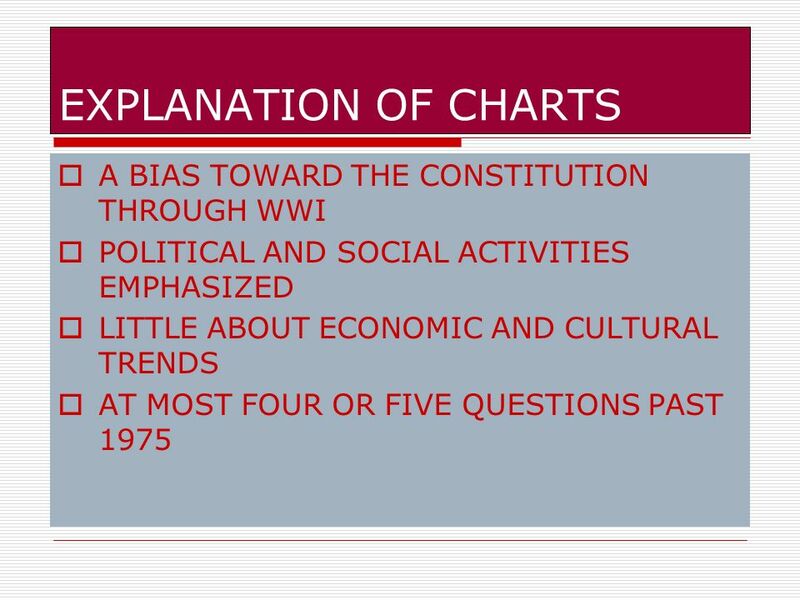 WHILE YOU HAVE TO KNOW YOUR FACTS TO DO WELL ON THIS TEST, THE QUESTIONS ALWAYS ASK FOR INFORMATION IN THE CONTEXT OF LARGER HISTORICAL TRENDS. 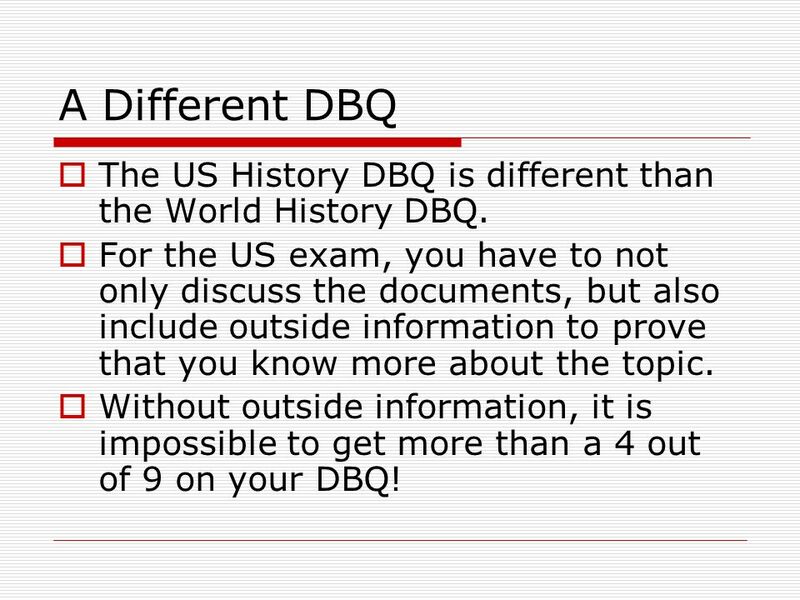 12 A Different DBQ The US History DBQ is different than the World History DBQ. For the US exam, you have to not only discuss the documents, but also include outside information to prove that you know more about the topic. Without outside information, it is impossible to get more than a 4 out of 9 on your DBQ! 17 Goals for the Year Take 5 minutes to come up with three SPECIFIC goals about what you hope to accomplish in this course. 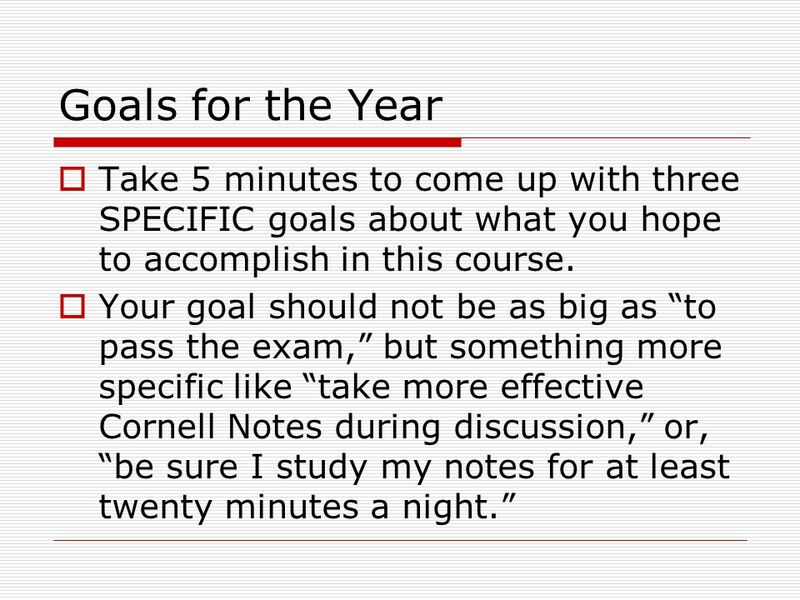 Your goal should not be as big as to pass the exam, but something more specific like take more effective Cornell Notes during discussion, or, be sure I study my notes for at least twenty minutes a night. 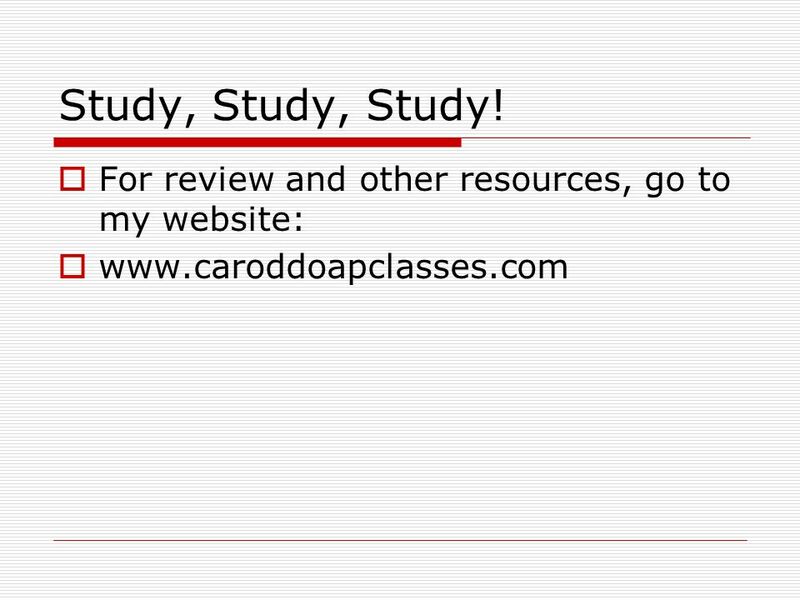 Download ppt "AP US History: Secrets of the AP Exam Orwhat you need to know to get through the next 32 weeks and pass the exam." HOOVER HIGH AP U.S. HISTORY. Todays objectives Students will be able to understand why they were very smart to sigh up for this course Students. AP US History Whats its all about…. Course Purpose AP US is a college level survey course designed to explore major themes, people, and events in American. THE AP EXAM. 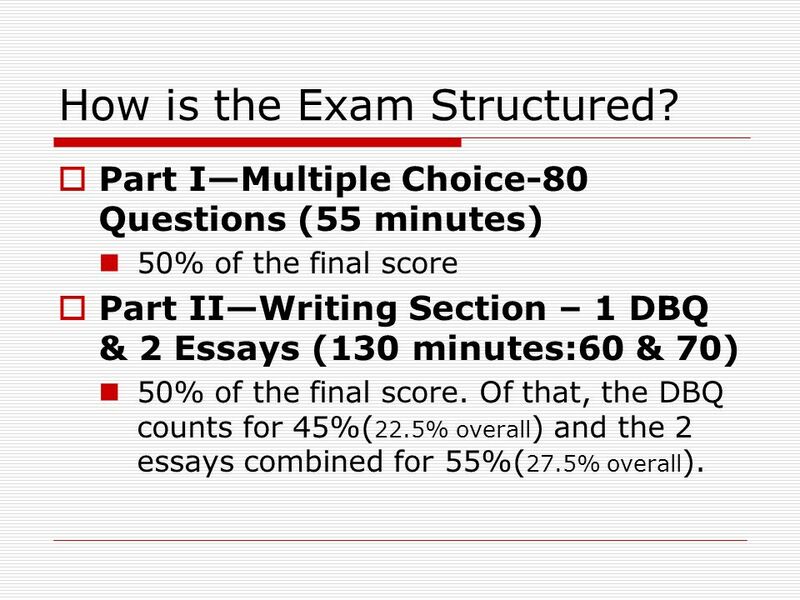 The exam is 3 hours and 5 minutes in length and consists of two sections: a 55-minute multiple-choice section and a 130-minute free-response. APUSH DBQ vs. AP Language Synthesis Essay: Face off. 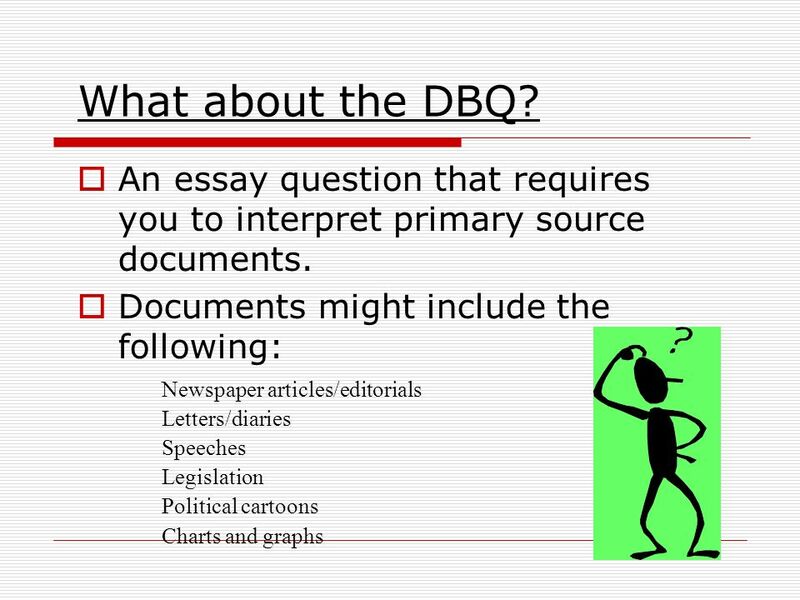 What is a DBQ? 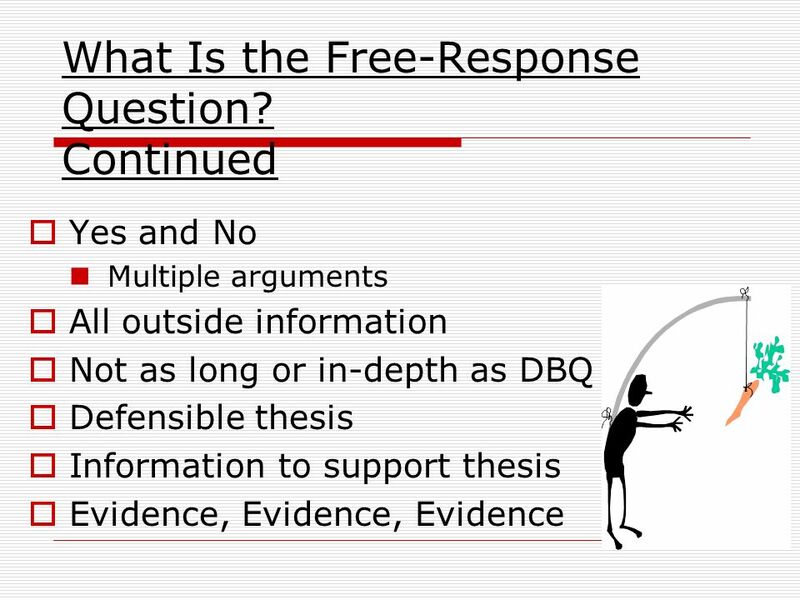 A DBQ is a documents based question. It is an essay on the AP Exam in which the student is required to both interpret documents and use. Analyzing the Cold War through historical documents Core I MRS. WEAVER. AP United States History Information for Parents and Students Teacher: Jennifer Lounibos Website: lounibos.weebly.com. + APUSH DBQ Lesson. + DBQ: Worth 25% APUSH DBQ needs to be written in a very particular way. It is *NOT* the AP Euro or World DBQ. Your APUSH DBQ writing. AP World History Multiple Choice Exam. Welcome to AP World History. What is the AP (Advanced Placement)? The AP, or Advanced Placement, indicates a college-level course. Through college-level. 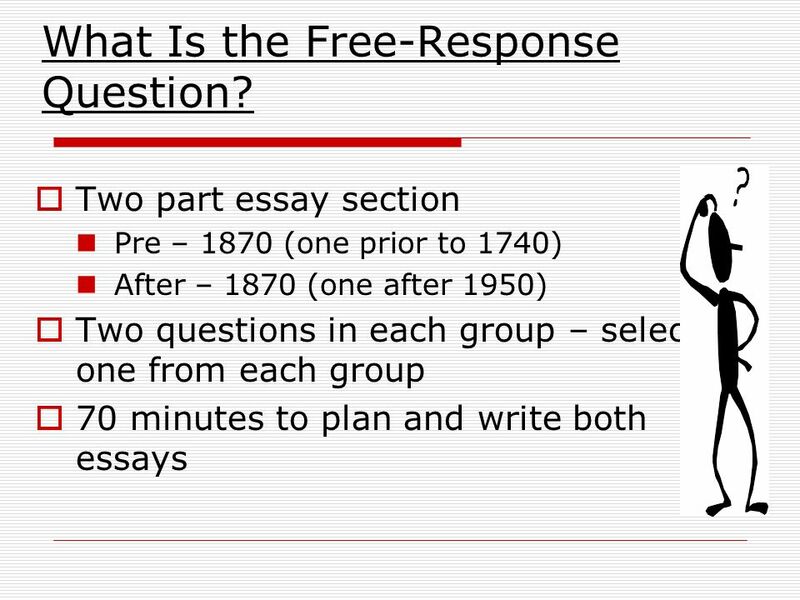 FRQ 101 AP US HISTORY. How to Write a DBQ Social Studies. DBQ’S MRS. ALLEY Lesson 9- Day 1. What is a DBQ? 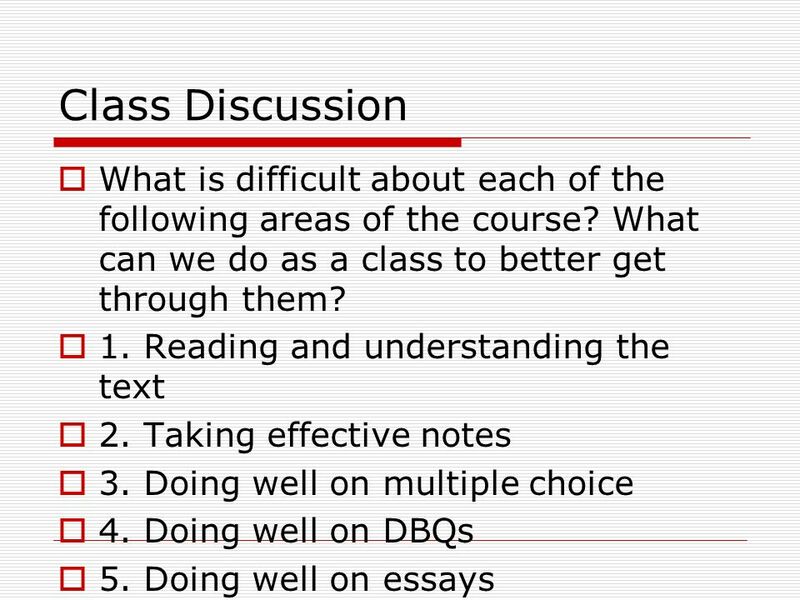  A DBQ, document based question, is a question that focuses around one or more documents.  The documents.